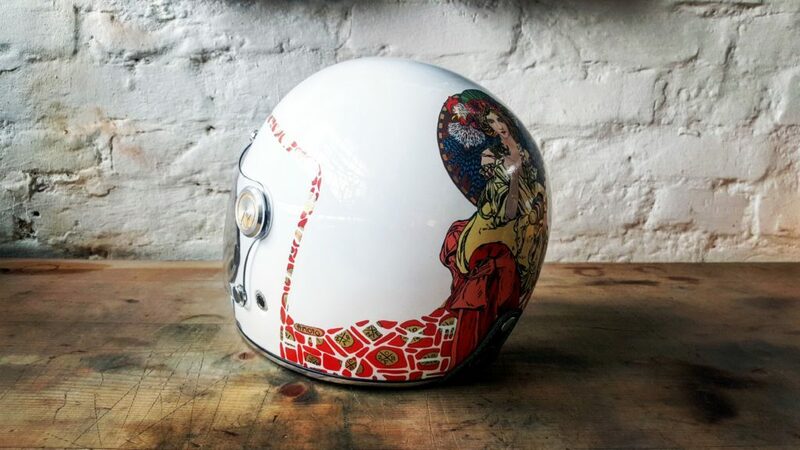 This collection is a tribute to Art nouveau (“the new art”), which flourished around 1890- 1910. In this period, curved lines and natural structures blossomed in architecture, painting and decorative arts. 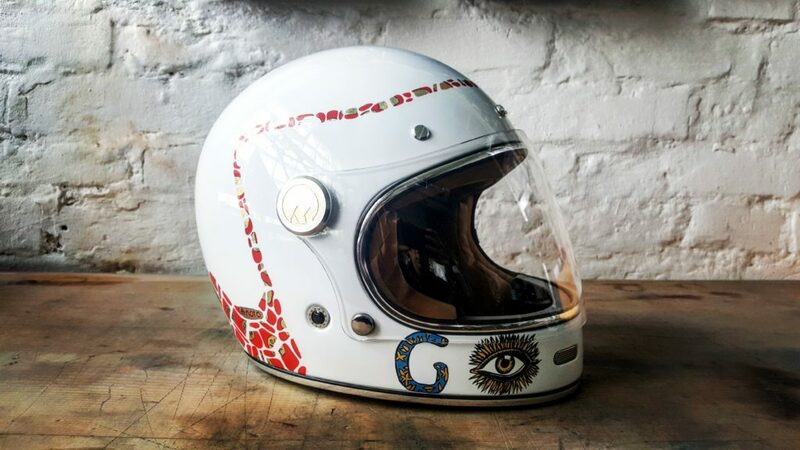 My helmets are mainly inspired by the french Art nouveau and the Paris 1900 Exposition universelle, as well as the following artists of the Vienna Secession movement: Klimt, Hoffman, Wagner and Moser. 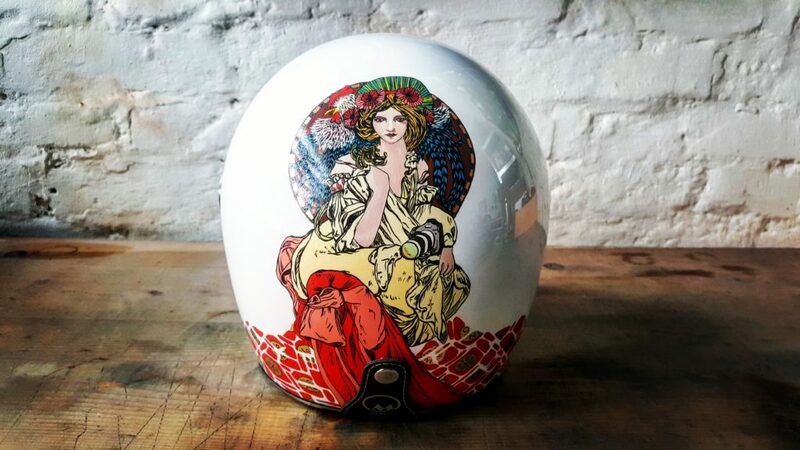 The strong development of posters, illustrated art graphics and artistic advertisement thanks to the development of lithography is another source of fascination. 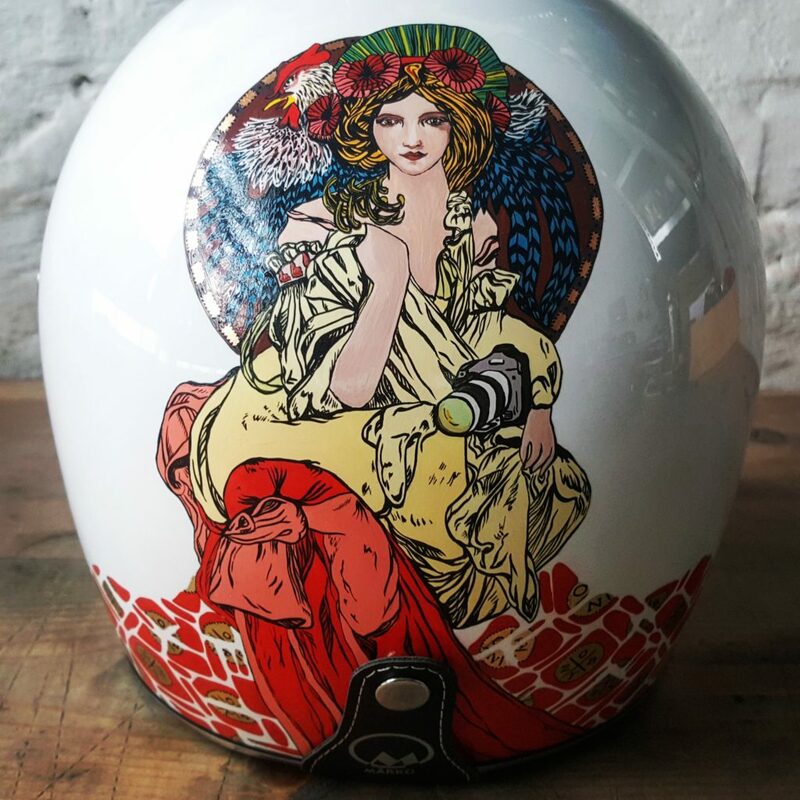 This particular helmet is a nod to the art work of Mucha and is based on his creation for the official guide to the Austrian exhibitions during the 1900 Exposition universelle in Paris. 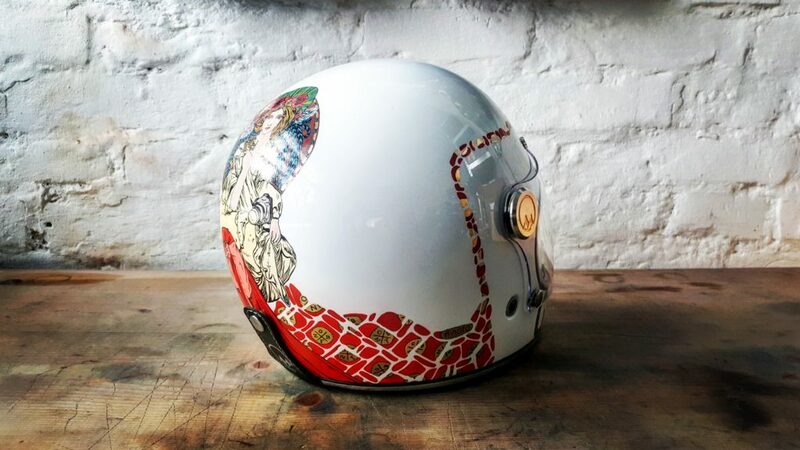 It is also inspired by the style of Gustav Klimt and the identity of the helmet owner: Götz Göppert. Götz is a Paris-based photograph who captures the grace of the world with a poetic style. 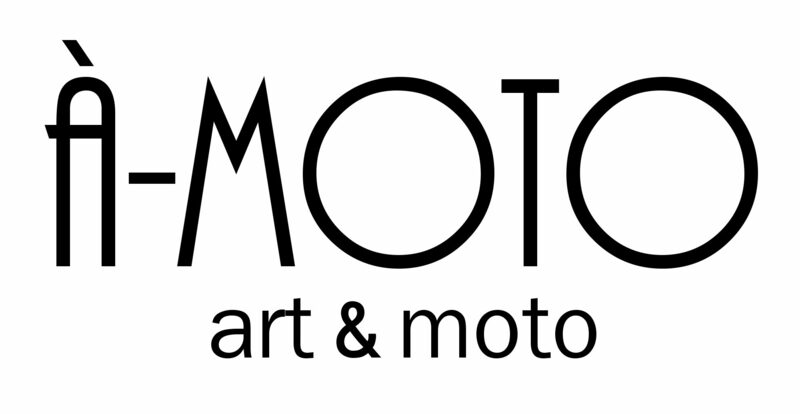 His timeless shots intercept an ephemeral reality and share unique moments of motorcycles and riders in motion. A second to hold your breath and the beauty of the movement is immortalized. You can spot the major nuances and differences between Mucha’s creation and mine. First, I replaced the eagle drawn behind the woman by a rooster to play with the symbols of France and Austria. Indeed, in the thirteenth century, the eagle was already depicted on the seals and armorial of Vienna. It is a strong emblem of the Habsbourg family and a symbol for the city. As for the rooster, it is connected to the french history and was very popular during the French revolution. Then I changed completely the expression of the woman’s face and placed poppies instead of olive branch in her hairs (Götz’s favorite flowers). The woman is lost in her thoughts, posing with a charming smile. Copper leaves on the frame create a fast religious halo of light, that broaden the aura of subject’s mystery. I also replaced the monument originally placed on her knees with an illustration of a canon ds1x: the camera of Götz. It appears like integrated to the painting and at the same time slightly conflicts with the big picture. The machine is actually in an unstable position but seems quiet and balanced. 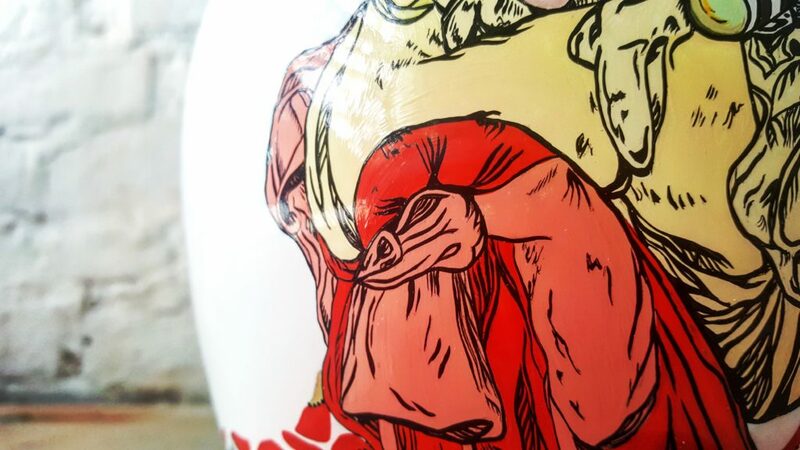 The texture and movement of the dress is quite similar to the original masterpiece of Mucha. Nevertheless I expanded her dress right and left in a Klimt style with red curves and gold leaves. 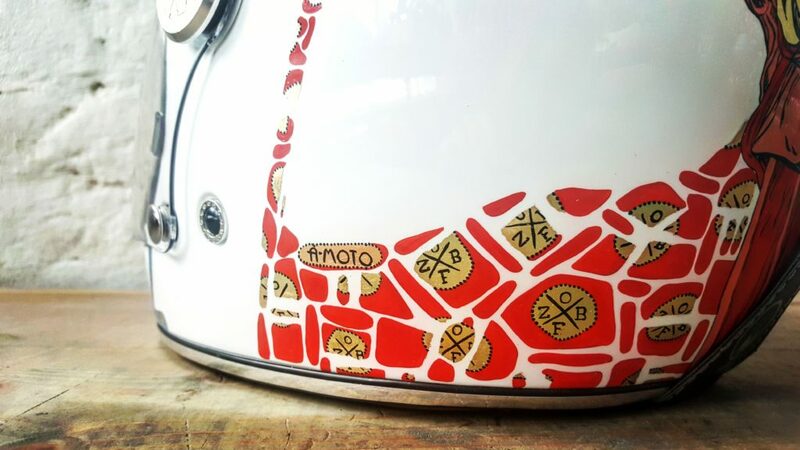 Götz had a special request and wanted to get the logo of community Zero Owner’s Band & Friends which I secretly added on the gold spots. The forms are structured with dots. 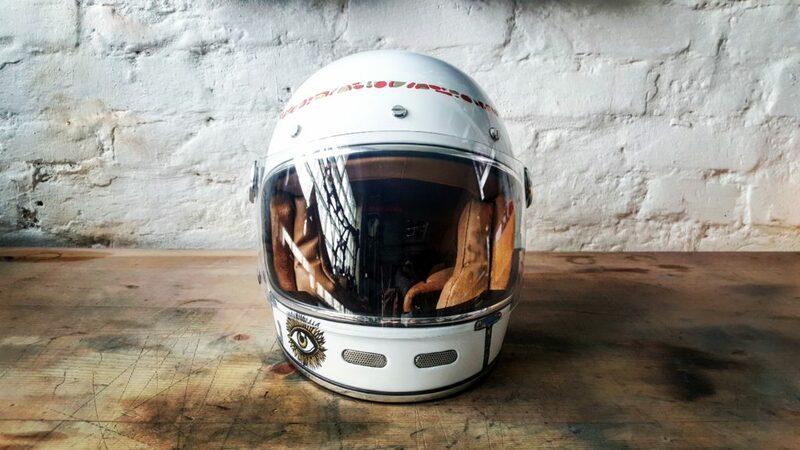 The dress is waiving right and left and joining into a frame to embrace the shape of the whole helmet. 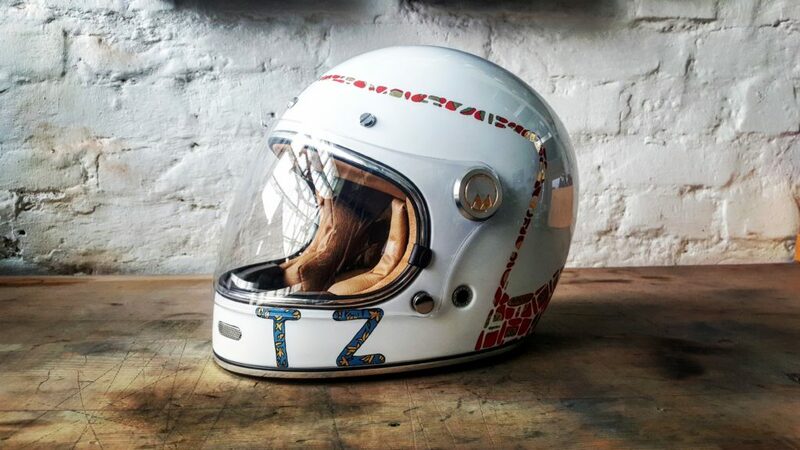 Finally, I painted the letters of Götz’s name on the front of the helmet. I replaced the “Ö” by an eye to illustrate the french expression: “l’oeil du photographe” (the eye of the photograph). In french, we used it to describe someone’s natural talent to capture pictures.